Which European countries have the harshest transgender laws? Participants hold a giant rainbow flag during the Brussels LGBT Pride Parade. Western Europe continues to lead the way in transgender rights, according to the Trans Rights Europe Map & Index 2016. The annual index and map, published in collaboration with the International Lesbian, Gay, Bisexual, Trans and Intersex Association (ILGA), reflects the rapidly evolving legal situation for transgender people in Europe. Amnesty International estimates as many as 1.5 million people across Europe are transgender, meaning that their gender identity differs from the one indicated on their birth certificate. The Index highlights numerous steps taken in parts of Europe to protect and improve the rights of transgender people. Last year, for example, Malta made history by passing new legislation that enacted new school policies for trans and intersex students. In 2015, Ireland passed its Gender Recognition Act, which allows people over the age of 18 to determine their own legal gender. Denmark also switched to a self-determination model. Many European nations are considering adopting similar models including Sweden, France, Belgium, Finland, Greece, Germany and Norway. 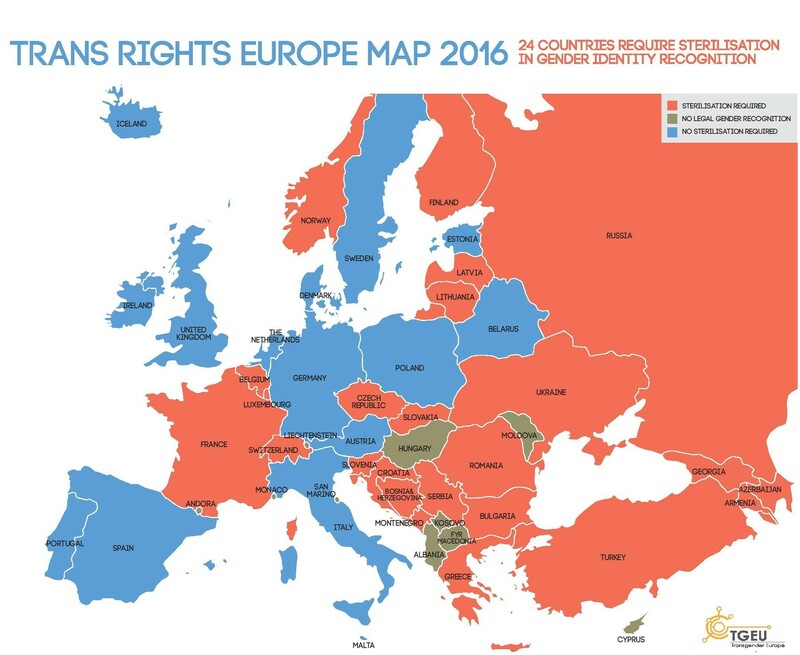 The situation may be improving in some European countries but the Trans Rights Europe Map indicates the stark differences that still exist. In 24 countries, marked in red on the map, transgender people are required to undergo genital removal surgery and sterilization before they can legally change gender. The countries marked in blue do not require genital removal surgery and sterilization while those marked brown do not have reliable procedures in place. Why do so many countries require sterilization? In many countries the sterilization requirement is based on an administrative practice from the 1970s. Richard Köhler, senior policy officer of Transgender Europe, explained to the Guardian: "Historically, the first law in western Europe that introduced gender recognition was in Sweden and they included forced sterilization, coming clearly from a time where sterilization of other groups in Sweden was in full swing, and this became the blueprint for other laws in western Europe." Some saw sterilization as proof that a person was 'serious' about wanting to change gender, others may have been anxious to avoid someone who had legally become a man getting pregnant. Forced sterilization is just one of many hurdles a trans person often has to overcome in order to have their gender legally recognized. While it is possible to adapt one’s identity papers in 41 states, 29 have maintained a robust set of legal procedures which can discourage and slow the process. While the process varies, it can include: diagnosis of mental disorder (37 states), medical treatment (31) and invasive surgery (24), single civil status which forces those who are married to divorce (22), and/ or exclude minors (34). There remain eight states in Europe where trans people are not recognized at all. Trans people continue to suffer a disproportionate levels of negative attitudes which lead to high levels of unemployment, harassment and abuse. Despite being protected according to the European Court of Human Rights, only 22 states have legal protections explicitly for trans people. Hate crimes continue to be a problem for all people of the LGBT community. Only 13 states in Europe explicitly prohibit trans-phobic violence. Despite progress, since 2008, at least 100 trans people have been murdered in Europe. Despite the difficulties transgender people face in Europe, the landscape is far better than in many parts of the world. The TGEU points out that European Asylum law foresees the need for EU member states to consider trans-specific asylum protection. But trans asylum seekers face an array of difficulties which include discrimination, prejudice, violence and access to necessary humanitarian services. At present, 14 European states have explicit laws for trans asylum seekers, 11 of which are in the EU. Despite the legal progress improving in western Europe, the dignity of trans people, along with lesbians, gays, bisexuals and intersex people, will only come with changing attitudes. At Davos, during this year’s World Economic Forum Annual Meeting, Joe Biden spoke out about how business can play its part in changing attitudes towards the LGBT community. In his speech on LGBT rights, the Vice President emphasized told delegates, "When it comes to LGBT rights in the workplace, the world is looking to you. You have more impact than anything the federal government has done." The European Union has also outlined a ten-point plan to improve social attitudes towards people of the LGBT community. The plan calls for more emphasis on education and creating a better understanding of people of the LGBT community. Who leads Europe for LGBT rights?